Product #20746 | SKU BT-4LH310E | 0.0 (no ratings yet) Thanks for your rating! The Panasonic BT-4LH310 31" 4K Production Monitor is suitable for a variety of production environments both in studio and out in the field. It features a 10-bit, 31" LCD panel that is LED backlit, and has a DCI-spec 4K (4096 x 2160) native resolution. It will accept 4K sources through SDI, HDMI, and DisplayPort. In addition to DCI 4K, it will accept QFHD/UHD 4K (3840 x 2160), 2K, and high definition video sources along with up to 16 channels of embedded audio. 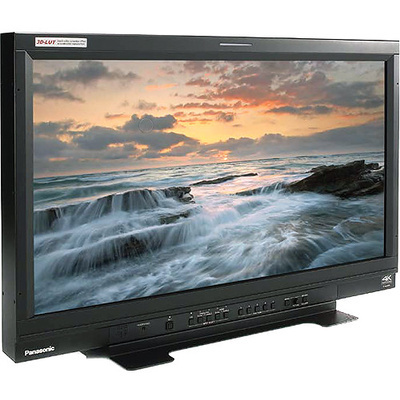 The monitor features four 3G-SDI inputs. When used with 4K signals, the image is split into quadrants and all four inputs will be combined into one 4K image. It features two HDMI inputs. Depending on the frame rate, bit-depth, and chroma sub-sampling one or both inputs may be required for 4K signals. And it features two DisplayPort inputs. As with HDMI, one or both inputs may be require, depending on the bandwidth of the 4K signal. For all other resolutions up to 2K only a single input per image is required. This means that in non-4K applications the four SDI inputs can be used to create a "quadview image", displaying all four images on screen at once. For local audio monitoring there is a stereo headphone jack as well as a 0.5W mono speaker. The monitor can be controlled remotely using RS-485, RS-232C, or GPI and has a tally port that will trigger red, green, or amber LED tally lights above the display. The monitor includes a removable desktop stand, and also features a VESA 200 x 200mm hole pattern on the back so that it can be attached to many standard monitor mounts. Calibration Function: The built-in calibration function can be used to automatically adjust the white balance, which can drift out of calibration over time, by using commercially available probe sensors and display analysers.